Are you a postdoc who is looking for a job, or will be soon? Add yourself to The List. Are you on a search committee and want access to the list? Email neurorumblr@gmail.com from an official university e-mail account. Leslie Vosshall took to twitter recently to lament the fact that only 25% of applicants for tenure-track positions at Rockefeller University are female. Others chimed in and said this was a common problem. You can see the discussion that followed at Drugmonkey. So wouldn’t it be great if there was a list of researchers who were looking for jobs – male and female – that search committees could peruse to search for applicants who were relevant but had not contact them? I went ahead and began the makings of such a list here. I am not yet totally sure what the best way to do this is. Should it be partially public? Or simply private? This is not a list for other postdocs to peruse, but one for faculty on search committees to examine. Is there other information that would be helpful that is not on the form? As always, go to neurorumblr for a list of open faculty positions. There are over 80 up already! This information will be added to the page soon (when I beautify it, because honestly that thing is pretty hideous right now). Congratulationst to Beth Stevens of Harvard for receiving a 2015 MacArthur fellowship. Her work has focused on microglia, which is surely an under-researched topic. The last neuroscientist to win the fellowship was Sheila Nirenberg of Cornell in 2013 for her work on retinal prostheses (though she is better known for her excellent work on neural coding). and how social plasticity can change epigenetic brain programming or reverse brain aging. They show us the mechanistic basis of trans-generational immune priming in invertebrates, perhaps facilitating the first vaccines for insects. 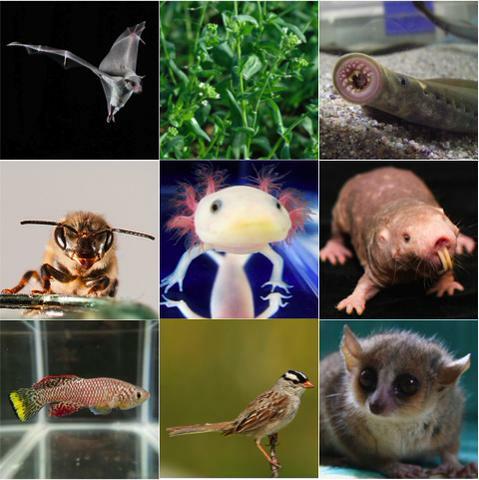 These processes and more can be studied across the levels of biological complexity—from genes to societies and over multiple timescales—from action potential to evolutionary. As models in neuroscience and animal behavior, honey bees have batteries of established research tools for brain/behavioral patterns, sensory perception, and cognition. Genome sequence, molecular tools, and a number of functional genomic tools are also available. With a relatively large-sized body (1.5 cm) and brain (1 mm3), this fascinating animal is, additionally, easy to work with for students of all ages. Beekeeping practices date as early as the Minoan Civilization, where the bee symbolized a Mother Goddess. Today, we increasingly value honey bees as essential pollinators of commercial crops and for their ecosystem services. Honey bees have been called keepers of the logic of life. They are truly. I would add mosquitoes, ants, deer mice, (prairie/etc) voles, cuttlefish, jellyfish and of course marmosets to the list. What is it that distinguishes economies that take advantage of new products from those that don’t? 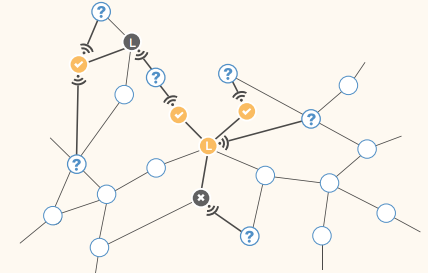 Matthew Jackson visited Princeton last week and gave a seminar on “Information and Gossip in Networks”. It was sadly lacking in any good gossip (if you have any, please send it to me), but he gave an excellent talk on how a village’s social network directly affects its economy. He was able to collect data from a microfinance institution in India that began offering credit in 75 villages in Kerala. Yet despite being relatively homogeneous – they were all small, poor, widely dispersed villages in a single Indian state – there was a large amount of variability in how many people in each village participated in the program. What explains this? Quite simply, the social connections do. When the microfinance institution entered the village, they did so by approaching village leaders and told them about the program, about its advantages and why they should participate. These village leaders were then responsible for informing the people in their village about the program. Jackson’s team was able to compile the complete social networks of everyone in these villages. They knew who went to temple with whom, who they trusted enough to lend money to, who they considered their friends, and so on. It is quite an impressive bit of work; unfortunately I cannot find any of his examples online anywhere. They found, for instance, incredible segregation by caste (not surprising, but nice that it falls out so naturally out of the data). What determined the participation rate was how connected the leaders were to the rest of their village. Not just how many friends they had, but how many friends their friends had, and so on. To get an even better fit, they modeled the decision as a diffusion from the leaders out to their friends. They would slowly, randomly tell some of their friends, who would tell some of their other friends, and so on. Jackson said that he got a rho^2 of 0.3 looking at traditional centrality measures and 0.47 (50% improvement) if you use his new model. The main difference with his new model (‘diffusion centrality’) appears to be time, which makes sense. When a program has been in a village for longer, more people will have taken advantage of it; people do not all rush out to get the Hot New Thing on the first day they can. Village leaders are not the only people that they could have told. 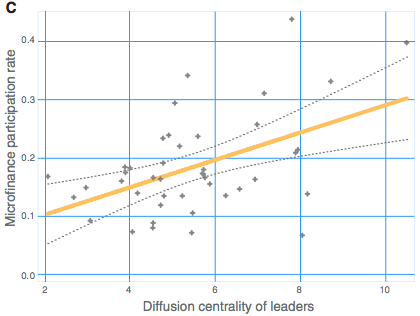 It would be nice if they could find more central individuals – people even better connected than the leaders. Impressively, they find that they can simply ask any random adult who would be the best person in the village to tell? And there is a good chance that they would know. This is exciting – it means people implicitly know about the social network structure of their world. The moral of the story is that in order to understand economic processes, you need to understand the structure of the economy and you need to understand the dynamics. Static processes are insufficient – or at least, are much, much noisier. Other neuroscientists do not take that idea seriously, given the great gaps in knowledge about the workings of the brain. “We are nowhere close to brain emulation given our current level of understanding,” said Cori Bargmann, a neuroscientist at Rockefeller University in New York and one of the architects of the Obama administration’s initiative seeking a $4.5 billion investment in brain research over the next decade. …The fundamental question of how the brain’s physical processes give rise to thoughts, feelings and behavior, much less how to simulate them, remains a mystery. So many neuroscientists see the possibility of reproducing an individual’s consciousness as unforeseeably far off. Count my on the Bargmann side of things (as I am in most things). Also, reconstruct all of those mysterious glia. What do they do, again? Is there a consistent learning rule between neurons? I cannot find my normal reference for this, but long-term potentiation, depression, STDP, etc is not the same in every anatomical region. There is a reason most LTP work was historically done in hippocampus. What about the extracellular matrix? Does it store our memories? Don’t forget hormones. They can directly enter cells; think about what we need to know to simulate their diffusion throughout the brain. Are you planning on sequencing your microbiome as well? How much of the rest of your body contributes to your cognition? What genes, where, how are they transcribed, when are they transcribed, how do the enhancers interact with etc etc. 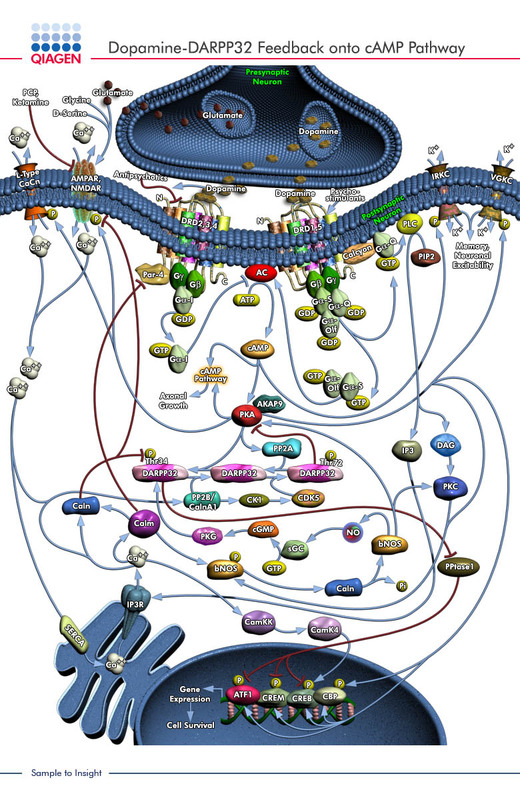 Have you ever seen an image of the molecular pathways that contribute to neuronal function? Here is a (likely incomplete) description of the pathway for dopamine in a single cell. Remember, every cell is different and has how many modulatory pathways…? In other words, we are probably not done solving biology very soon. In neuroscience, there are more unknown unknowns than there are known unknowns. 40 years for ‘mind uploading’ is not even wrong.